At a time when everything seems mapped, measured, and understood, this river challenges what we think we know. It has forced me to question the line between known and unknown, ancient and modern, scientific and spiritual. It is a reminder that there are still great wonders to be discovered. We find them not just in the black void of the unknown but in the white noise of everyday life — in the things we barely notice, the things we almost forget, even in a detail of a story. In this exciting adventure mixed with amazing scientific discovery, a young, exuberant explorer and geoscientist, journeys deep into the Amazon—where rivers boil and legends come to life. When Andrés Ruzo was just a small boy in Peru, his grandfather told him the story of a mysterious legend: There is a river, deep in the Amazon, which boils as if a fire burns below it. Twelve years later, Ruzo — now a geoscientist — hears his aunt mention that she herself had visited this strange river. The Boiling River follows this young explorer as he navigates a tangle of competing interests — local shamans, illegal cattle farmers and loggers, and oil companies. This true account reads like a modern-day adventure, complete with extraordinary characters, captivating plot twists, and jaw-dropping details — including stunning photographs and a never-before-published account of this incredible natural wonder. 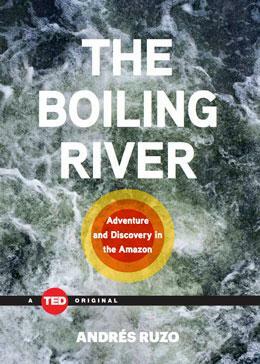 Ultimately, though, The Boiling River is about a man trying to understand the moral obligation that comes with scientific discovery — to protect a sacred site from misuse, neglect, and even from his own discovery. 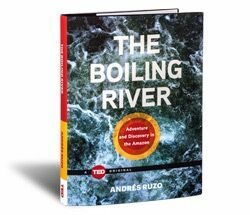 Read an illuminating interview with the author on Gizmodo : "Scientists Discover a Boiling River of Amazonian Legend"
Andrés Ruzo's interview with IFL Science : "There’s A River Of Boiling Water In The Amazon Rainforest"
On Huffington Post Science : "This Incredible 'Boiling River' is a Scientific Enigma"